This story is about a scandal. 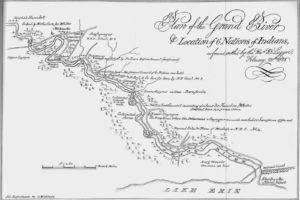 By the time the digging stops on the Grand River Navigation canal system, colonials will have, once again, robbed and left destitute their invaluable Indigenous allies, who have already lost everything on account of Great Britain. Upper Canada’s William Hamilton Merritt and David Thompson 1 are entrepreneurs and visionaries and they catch a bug. They catch “canal fever,” which, along with malaria, is running rampant on this continent in the 1830s. “Canal fever” is an unhealthy obsession with building canals – a pun on the mosquito-born illnesses that plague the navvies who do the digging and quarrying for the waterways and canals. 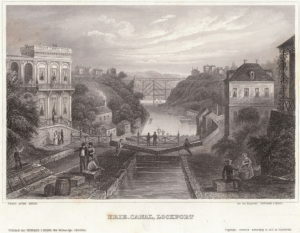 Merritt and Thompson and the colonial government pick the Grand River for a water highway from Upper Canada to Buffalo. And nothing but trouble ensues. Because of the American Revolution, the Haudenosaunee lose not only their homes but also their sovereignty. After General Sullivan’s massive scorched earth campaign in the Mohawk valley, the Eastern door of the Longhouse is gone. The land is devastated. (Swiss-born) General Frederick Haldimand, Governor of Quebec (1778-1786), warns the British of impending local uprisings: there are many displaced, allied warriors camped out at Niagara and he (Haldimand) has to do something quick to settle outstanding land issues to avoid a revolt. Brant is not “given” anything. He claims the Grand River and adjacent lands for his people. He expects the support of the Crown in response to its promise to pay and compensate the Haudenosaunee for their invaluable assistance and losses incurred during the war and Brant brings his people (those willing) to the Grand River territory to build a new settlement on their upper-country hunting grounds. 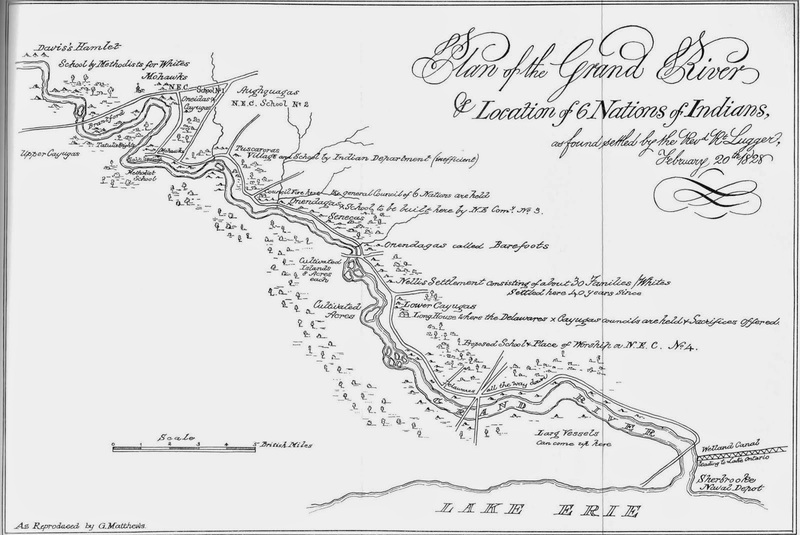 In 1784, due in great part to the efforts of Pine Tree Mohawk Chief Joseph Thayendanegea Brant and Brant’s Volunteers (fighting as allies of the English during the American Revolution), the Six Nations or Haudenosaunee (Mohawk, Oneida, Cayuga, Seneca, Onondaga and Tuscarora) own the Grand River and six miles on either side. NB: The Haudenosaunee are not subjects of the Crown. The Haudenosaunee are the Crown’s allies. Future generations of Canadians, including Mohawk F.O. Loft, muddy the two concepts to the detriment of the People of the Longhouse. For the growth of Canadian markets and the fostering of Canadian-American trade, W H Merritt and D Thompson see stars in Buffalo’s skies. Buffalo is end of the line for the Erie Canal. How best to get to Buffalo from the British-held upper country? That is the big question. Perhaps the old Tinaatoua, a.k.a., Ouse, a.k.a., the Grand River, provides an answer. Why choose the Grand River for a waterway? Early in the 19th century the Grand River is dammed at its mouth. A feeder line ending at Dunnville takes smallish craft to Welland Canal. Late loyalist Absalom Shade uses the river. Shade is a mill owner and a distillery operator who lives upstream on the Grand in what is present day Galt/Cambridge. Shade builds and floats his giant “arcs” downstream. Shade’s large rafts demonstrate what Douglas Reville in the History of the County of Brant calls a “phantasmal” opportunity, which is a river highway to market heaven, so to speak. Entrepreneurs like Shade argue the entire Grand River makes a logical addition to the North American canal waterways system. Brantford to Buffalo. (Or for Canadian commodities and markets, Brantford to St. Catharine’s to Toronto or Montreal). 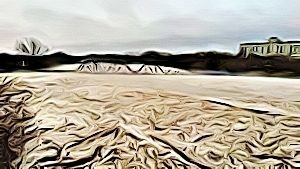 From the upper country fast river currents will float to Lake Erie raw products – the interior’s gypsum of plaster, wheat, sowbellies and timber – and then return the favour. The Grand River can paddle people, luxury imports and manufactured commodities upstream. For Merritt and Thompson the city of Buffalo offers the main jumping-off point to American markets and all eyes in Brantford are on burgeoning Buffalo as desirable means of entry from British Upper Canada into the United States. Visions and visionaries go bad. The Grand River Navigation Company (Bruce E Hill’s book is available at Brant Historical Society) details not only a financial disaster but also an Indigenous scandal, which one can drop at the feet of the entrepreneurs who catch canal fever. In particular David Thompson and William Hamilton Merritt. But let us not forget other culpabilities. The two canal builders get official sanction from colonial officers John Colborne and John Henry Dunn. Colonial mendacity and audacity are beyond imagining – even for those who already don’t trust the beleaguered British administration. Digging a mid-19th-century canal is a job for supermen – mostly poor Irish supermen. Canal-building takes many designers and tinkerers – mostly Scottish and American. Paying for a canal waterway takes significant financial and natural resources. 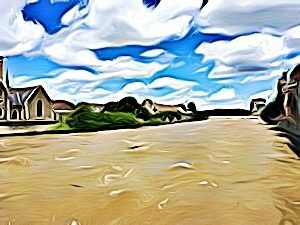 The new colony runs on a hope and a prayer and, as yet, does not have enough of what it needs to build another, newer canal system – not enough money, not a river, not adjacent land. So. Who has money? Where’s the river? What about land for towpaths? Call this Indigenous federation what you will – the Iroquois League/the Six Nations Confederacy/the Haudenosaunee/Rotinonhsyonni/the Grand River People of the Longhouse – they have money. They are rich. Filthy rich. At least £40 000 rich. Not only that! They own a river. They own land. They own minerals. And, may saints preserve us, the Haudenosaunee people start to be fewer in number than American-born settlers and that makes their pockets ripe for the picking. As mentioned, Brantford and the Grand River lie within Six Nations Territory (see the Haldimand Proclamation). Buffalo grows apace. But in 1822 Brantford itself is small. Less than 100 people according to James Wilkes, whose memoir Reville excerpts. Wilkes recalls hard travel on the detestable roads. “The principal trade was done with the Indians, but there was some through travel on the way to Detroit. This section was known as the Grand River Swamp, and twenty to thirty miles a day was big travel, so that taverns were, of necessity, numerous” (p71). Taverns may be numerous because roads are terrible but for sure the upper country’s wheat farmers and stock producers, drunk or sober, are desperate to get commodities to and from Buffalo. Reville says many “wide-awake” souls in the 1820s figure the Grand River’s water levels might permit slack-water navigation. The waterway will take engineering and “tinkering.” Some locks and some dams and maybe a few canals. Lachine, Rideau and Welland canals are making a go of it – sort of – and settlers imagine the ancient Tinaatoua with improvements might compensate them for the world’s worst highways and byways. For the most part the Grand River is a fast-moving shallow river and tinkering is operative word. 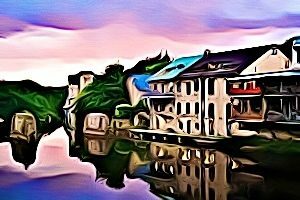 Nonetheless canal fever is a perfect front for individual loyalists and a few Indian entrepreneurs and Scottish land jobbers and the Crown – all of whom declare their investments should return big money. And so the Irish supermen start to dig. But do the colonial officers care about a return on the money, or do they want to impoverish the Haudenosaunee? For real this time. Why do some people believe the Grand River’s Six Nations Confederacy is impoverished in 1832? Once-upon-a-time the Haudenosaunee on the Grand River are rich. In “Six Nations (Haudenosaunee) & the Haldimand Tract: Beliefs versus Facts,” the ever-cautious Deyoyonwatheh notes Sir John Colborne believes the Six Nations Confederacy “then impoverished [pre 1832]” will benefit from the opening up of the Brant-Haldimand region. Hold on. Why, one asks, is the Six Nations Confederacy on the Grand River impoverished? From 1832 to 1842 they have enough money tucked away (somewhere) to build an entire upper-country canal/waterways’ system. Oh. Right. The British hold Six Nations’ money. Following 1815 and the relatively peaceful years of Anglo-American relations, the warrior nations have plenty of money but what they do NOT have is political clout. Councils at Onondaga know they need clout to get access to their own funds. Being “wards,” the Indigenous receive a paltry allowance, which is designed to keep them living at a subsistence level. Why has the ferocious Iroquois League/the Six Nations Confederacy fallen so low in the eyes of the British? It’s a matter of usefulness. In the aftermath of the War of 1812, Great Britain enjoys a precarious calm on the North American continent and, as long as the United States does not nibble away at British territory or invade Canada, the Crown believes it has no use for its erstwhile allies. The poorer the old allies are, the better – the less threatening. Britain does not need a wealthy sovereign Indigenous country competing with the immigrants for markets. During the extended peacetime, the Secretary of State for the Colonies feels free to toy with colonial governance and shifts First Nations to a civilian administration and scoops all available Indian monies, promising, of course, that the trustees will be trustworthy. Results are shameful. The Family Compact’s men play their “wards” like checkers. They shove them around and claim their fertile land. White (pre 1815, mostly American) settlers control the homelands and hunting grounds of the First Nations: Neutral, Wyandot, Mississauga and Haudenosaunee. Strangers get right into the farming business and remove considerable sections of Carolinian forest. And to put the capper on the caper, the colonial government with the assistance of the Grand River Navigation Company, impoverishes the only Indigenous people in British North America who have significant financial resources. But I get ahead of myself. Follow the money. Early on, Brantford threatens to transform itself from cedar swamp into farmland. United Empire Loyalist/Chief Justice John Beverley Robinson, by turning a blind eye to unlawful settler incursions into Indian Territory (see Sidney Harring’s White Man’s Law), encourages land jobbers and/land sharks, or, as they call themselves, “deserving” squatters – people like James Wilkes and his friends – to put down roots in Brantford and Brant County and to make improvements. Settlers pay rents, not as much as they should, of course, to the Haudenosaunee on the Grand. Under lawless conditions but in an optimistic mood about Brantford’s growing agriculture sector and the possibility of building other canal villages, the two main canal promoters, William Hamilton Merritt and David Thompson 1, get together with other interested riverside stakeholders. Brantford. Cayuga Heights. Caledonia. All are located within the Haldimand Tract, which, as stated, belongs to the Haudenosaunee. All will become canal villages. Merritt and Thompson want to act on the Grand River canal venture and these two push governments to make a seminal decision. Promoters want to use funds that are not theirs! Promoters decide to use Six Nations’ money! In 1832 the People of the Longhouse have lots of money. More than any other community or First Nation in British North America. How much you ask? Why buckets of the stuff. For over fifteen years the Confederacy has enough money to build canals and “tinker” and maintain the navigation system. But the Haudenosaunee councils have no access to their money. There’s the snap. By 1832, Merritt and Thompson line up their ducks and with some valuable help from high officials they charter the Grand River Navigation Company – the Navigation. Six Nations Councils are understandably nervous. Thompson holds 2000 shares. Merritt has 2000 shares. A host of millers and forwarders including a certain Barton Farr hold a nominal number of shares. Last but not least, the Six Nations Indians own 1760 shares but that is all right. (At the close, the confederacy will own 80% of the shares). Lest the confederacy worry itself sick about an enormous and stunning investment being made on the people’s behalf, a few canal-committed chiefs observe some high officers want this project. The high officers are Colborne and Dunn. They are canal lovers. Sir John Colborne, 1st Baron Seaton, is colonial governor. He is a staunch Anglican and serious about canals. He loans his own money to the Welland Canal Company. John Henry Dunn is about to prove himself. Some (many) say John Henry is not the sharpest tack in the box. All work and no play make Jack a dull boy but not a poor boy from all accounts. He is a Six Nations trustee and the Welland Canal Company’s president. Oh. And by the way. Dunn is the Receiver-General of Upper Canada. The man blithely ignores such a rarefied concept as conflict-of‑interest. Dunn knows influential people and like Governor Colborne he catches canal fever and he trumpets the value of a colonial waterways system. Why worry? Dunn falls out with the canal magnate William Merritt over Dunn’s refusal to release a promised 50,000 pounds in debentures for Welland Canal against which Merritt has secured loans. But that conflict is for future days. Promoters Dunn and Merritt are cronies at the inception of the Grand River Navigation Company. Canal builders know all along John Dunn is a valuable crony to have. Dunn can command the hefty Six Nations funds to which the Six Nations themselves have no access. These funds, which have accumulated from years of timber sales and land sales and land surrenders, are enough to build a waterway. After Colborne himself approves the money grab the canal game is afoot. The Grand River venture is monumental and controversial but leaping from the foam both John Henry Dunn and John Colborne rise to meet the occasion: we can impoverish the undeserving Indians. Buffalo here we come. Ongoing Haudenosaunee resistance to the canal venture is a fact of life. Six Nations’ councils of chiefs challenge the Navigation. They have every right. More than a right. River and bonds and trust monies in British general-revenue, and thousands of un-surrendered acres and gypsum and trees – all of it, every single stick of wood – belongs to them. Wiley schemer old Augustus Jones and Six Nations Tory Billy Kerr (husband of Elisabeth Brant, daughter of Joseph Thayendanegea Brant and Catharine Adonwentishon Croghan, and grandson of Molly Brant and William Johnson) remain on side with the Navigation throughout the early 1840s. But in the early days (1832), Tekarihogan, Chief John Brant (Elisabeth Brant’s brother), and after him most of the Six Nations’ Councils at Onondaga say no to the venture. They worry about the dams. Flooding and a host of other problems are evident with Welland Canal. Chiefs worry about Queen’s Park’s sloppy administration. Haudenosaunee councils do not want outside promoters, either public or private, to assign town-sites and waterfront lots and towpaths. Not within their Territory. Settler voices overrule Indigenous voices. Even a certain Barton Farr makes a claim for flooding on land he has scooped from the Six Nations. Over the Haudenosaunee’s objections, the Navigation’s promoters charge ahead. For the Navigation’s sake and incoming settlers’ prosperity, the colonial government creates and lays out new villages within the Haldimand tract. Brantford. Cayuga Heights. Caledonia. York. Indiana. Cayuga. In 1834 the Navigation hires Ranald McKinnon to build a dam in Seneca and a dam in Caledonia. Completed in 1840 the dams make waterpower available. Mills pop up everywhere and they grind out a lot of money for the millers but that is the extent of it. Ever weak and fiscally unaccommodating the canal system, the Navigation, does not show a profit. The Haudenosaunee sink into poverty. The Haudenosaunee investors never see a dime. Not a thin white dime. The enterprise remains forever iffy. The canal company starts out on risky footing and so the waterway continues to the tipping point. The Navigation’s directors manage risk. They have a charter to that effect. In most companies a heavy investor wants some say on the board of directors. Directors want to hold shares in a company they plan to make profitable. In the Navigation’s case neither is true. Crooked dealings (and directors not following the company’s bylaws) are the writing on disaster’s wall but no one in authority cares. In no time at all the major shareholder is the Six Nations Confederacy, who owns 80% of the company’s stock. The Confederacy provides river and land and timber and gypsum and money, and so forth. But. The Confederacy is not on the Navigation’s board of directors. Two of the company’s directors, that would be Merritt and Thompson, commit fraud. In their process of selling shares high they dump stocks – and buy shares back later at a depressed rate. Such conduct is unlawful. As directors of the company, Thompson and the millers and forwarders serve themselves first. They keep tolls low – too low for the company to show a profit. Even the Indian Department believes the sucking sound it hears is the Navigation. With its need for constant investment the new canal company is like Mohawk Lake. Bottomless. And false. The reckless attitude of whites toward the finances and well being and security of the Haudenosaunee is a disgrace. (A similar disgrace occurs in America. For Indigenous headrights – oil – whites murder some of the wealthy Osage Indians of Oklahoma.) Settlers’ utter disregard for the worthiness of the settlement at Grand River and settlers’ utter disdain for the right of an Indigenous nation to lay claim to wealth leads to criminal carelessness. Six Nations continue to “buy” the Navigation’s stock but the story is same old. Chiefs and councillors at Onondaga have no idea when the last stock purchase occurs. Indigenous councils wield no control over the company’s development and they watch in helpless anger as the health of their communities deteriorates. Councils believe, and by rights as it turns out, that land-patent numbers are not commensurate with occupied lots. 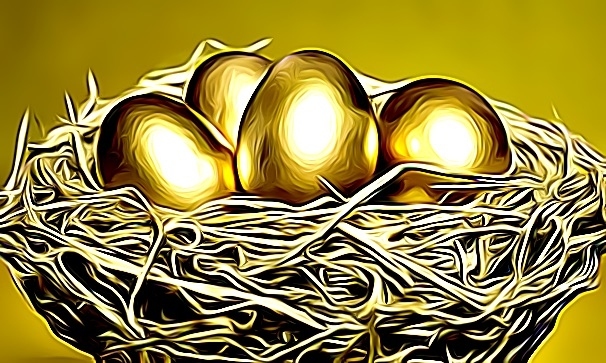 People starve because their annuity is washed up. Meantime, David Thompson lives like a lord at Ruthven Hall. Anxious to grab land and resources, Anglo-American settlers and Irish canallers (navvies) and nefarious lumberjacks swarm into Indian Country and into the new Navigation villages and even into the Grand River Settlement. The river floods and dries up and rolls on. Navigation’s books dissolve in a moist mess. Perhaps Indian Superintendent David Thorburn can sort out the problems. Samuel Peters Jarvis holds the post of Chief Superintendent of Indian Affairs in 1837. Jarvis gets fired in 1844. Jarvis is a man in disgrace for the alleged embezzlement of Indian funds, whereupon Special Commissioner David Thorburn takes over. Thorburn rules on Six Nations’ land disputes. But! Thorburn is also a director of the Navigation and unlucky for him and everybody else he is a man in serious conflict. David Thorburn works for the flimflam Indian Department. Thorburn feels duty-bound to support the government’s commitment to waterways. He has an obligation to the company’s powerful directors. We remember Thorburn also carries a fiduciary responsibility to the company’s hapless investors – the Six Nations. For Thorburn and the others ratting about in the Indian Department the circumstance is more complicated because the Navigation is a two-headed creature: a Crown and a public corporation. No one, it seems, can float the company into the black, and the Six Nations Confederacy gets trapped in a financial labyrinth. The Navigation does not thrive and David Thorburn cannot breathe life into it – in part because millers/directors continue to refuse to pay the tolls. Speaking of not paying . . . The company never pays the Six Nations for non-surrendered expropriated land nor returns a single penny of investment but most remarkable is this turnaround: the company is forever in need of cash infusions and uses up Six Nations’ capital monies in fifteen years. The Navigation wrings so much out of Six Nations’ trust funds the people actually land in debt to the Receiver-General in 1843–44, right about the time the brand-new and salubrious Caledonia with the village’s very profitable mills bursts upon the Haldimand scene. Accurate bookkeeping is not a strong suit of the Indian Department, which consciously/unconsciously realizes its books will never (must never) balance out in favour of a First Nation. In The Grand River Navigation Company Bruce Hill quotes from Reverend W. H. Landon’s letter to Lord Stanley. Nothing describes Six Nations’ misery more simply than this following observation: “many of the Six Nations the year before [the post-1837 period] perished from want of food owing to the non-receipt of funds expended by the government on the Grand River Navigation Company” (p23). William Merritt begs the Governor General for yet more money: “The Indians hold 80% of the stock, they receive no dividend, no income, and can have no prospect of receiving any until the work is in successful operation throughout” (p51). Who is responsible for the mysterious financial discrepancies and missing monies in the scattered Indian Department? Ontario historian David Shanahan insists Samuel Jarvis is innocent of the embezzlement charge that gets him fired. Jarvis is an infamous Tory with a history of irascible behaviour. Historian Shanahan believes Jarvis falls afoul of the rising power of Reformers. Who are some notable Reformers of the period? David Thompson 1 is an Oppositionist/Reformer. Before Jarvis’s dismissal, Samuel Jarvis is openly critical of David Thompson. Jarvis dislikes Thompson’s sharp practises. There is no love lost between these two. Shanahan argues it is not Jarvis but the Navigation’s own directors who are guilty of monkeying around with Indian monies. No matter. It is Canadian history. The winner writes the story and, as James W Loewen illustrates, when it comes to the Indigenous, teachers teach lies. Everyone then (and now) blames Jarvis for embezzling Indian money. William Hamilton Merritt stays a hero. Gets his own 8 cent stamp. Lieutenant-Colonel David Thompson and Ruthven Park. What can one say about the Navigation’s other powerful director? David Thompson is a tough guy with a weak constitution (see Quirk, L. K. The Thompsons’ Town: Family, Industry, and Material Culture in Indiana, Ontario 1830–1900 2010). Larger than life in many ways Thompson is neither an honest nor a sympathetic businessman, which, one supposes, makes him believe he is just a shrewd operator and not an out-and-out heartless sonofabitch who squeezes the juice from ashlar stone. In Ontario the main organizing symbol is not gold but land. In 1845 in the midst of the Six Nations’ severest financial shortages, Thompson, the former Navigation director and mill owner and liquor mogul and magistrate and Member of the Legislative Assembly, constructs his Greek-revival mansion on a vast swath of land (Ruthven Park indeed! ), which is not really his. Ruthven Park mocks the poverty-stricken landowners, who finance the canal venture and vicariously finance the villa and who live on a small section of their original land allotment. As busy as a bee in Indiana, Navigation’s director Thompson understands the canal company’s sorry balance sheet. Canadians can hear train whistles and see the lights at the end of the tunnel but waterways are an important means of carrying commodities. During the building of Ruthven Hall, the Grand River highway carries a significant level of river traffic but the corporate company, “the Navigation,” touches bottom. Despite extensive river use, the company is not performing up to anybody’s idea of peak. Under desperate circumstances David Thompson is particularly Scroogey. He leads the millers by example and refuses to pay tolls. Thompson’s health is as fragile as his moral compass. He dies in 1851. Rather than a guilty conscience, perhaps malaria, picked up during his days of overseeing the Welland canal, is the culprit. Mogul wannabe David Thompson 1 pretty much disappears from the Canadian narrative, and the village of Indiana fades away. Indiana, once the home of the high and the mighty, is a ghost town and bird sanctuary. Ruthven Hall pays for itself through weddings. The park is a bird sanctuary. The setting of Ruthven is stunning and both birds and brides love it. Back in the day, likely for tax purposes, David Thompson tries to undervalue his assets. Turns out he is right. Indiana isn’t worth anything. No wonder the Navigation company seems rudderless. The Grand waterways system swirls in a perfect maelstrom – administrative, financial, structural and ethical – and David Thompson 1 is the offender-in-chief. Looking at the condition of the starving people on the reserve, one might say Ruthven Hall is ruthless hall. Of course there are malingering complications with canal fever in and of itself. Not all of the Navigation’s drawbacks are systemic or fraudulent. Tolls and revenues do not meet projections because many farmers are doubters and they continue to ship goods by land in spite of bad roads. Wooden locks are ripe for fast decay and money for necessary repairs and upkeep is in short supply. Ongoing cost of the Navigation is crippling. Debt and deficit in a nascent colony where economic downturns prove the norm provides no legitimate follow-up to Six Nations’ funds. Public money is scarce. The little money that there is drifts toward the needs of railroads and Canada’s entrepreneurs who will build them. Failure of the Navigation to turn a profit shocks the powerless Six Nations in the 1840s. By the 1850s shock waves reach upstream to Brantford citizenry. Brantford Canal opens in 1848 but the Navigation is already stressed to breaking. The town of Brantford eyes the railroads with warmth but the local citizenry is responsible. Brantford does support the failing canal company with debentures and loans throughout the fifties. Rail aficionados and the skeptical Brantford Expositor get it right. Railroads win. Trains take the Navigation’s stations and commandeer tolls but what’s a poor town to do? Brantford puts up thousands of dollars and the Navigation defaults on payments. Historian Cheryl MacDonald writes “Help arrived in the form of the Brantford and Haldimand Company, Ltd. The new company bought the locks and dams that had formerly belonged to the GRNC [the Navigation], with the town of Brantford holding the mortgage . . . The Haldimand Navigation Company had sold 75% of its stock, continued to earn revenue from tolls and had spent most of its money in repairs but still the dams and locks were far from being in a safe and satisfactory condition” (p279). Further petitions for government and municipal monies get denied. Brantford’s town council is left with no option. Brantford takes the last step and forecloses. New Navigation and Brantford go to court. In 1861 one Judge Spragge informs the wide-awake Brantford citizens they are entitlement to “some remedy” under their statutory mortgage, and Spragge determines that Brantford owns the corporal remains (Hill). Citizens express dismay and “alarm” at the extent of the mess. Hill quotes the Expositor, “concealment from the citizens of such an alarming state of affairs [in the Navigation] is absolutely criminal” (p70). Indeed. Criminal tomfoolery has long been appalling and shocking and rampant as between the Navigation and the Six Nations Confederacy but when tomfoolery dares to dump its depredations on Brantford’s doorstep a newspaper’s editor sits up. Where is a wily Ariadne when you need her? When it comes to finding settlements and offering restitution? Where is the guiding string to show interested parties a way out of the Navigation’s maze? Financial threads in government accounts, Thompson accounts, and Navigation accounts stick together [see Hill]. Nothing seems to match up. Land patents (Where are they? Who holds them? When are they registered? ), towpaths (How big? Where are they? ), right-of-way lands around the dams and locks and towpaths (How large? Who sells them? Who pockets the profits? ), timber sales (Who gets that money?) and just about everything within the Haldimand Tract incites disagreement and stirs up a court case. Every doubt gets substantiated and every question lacks an answer. Alfred Watts is a human dynamo with an Electric Dynamo. He and his electrical device paddle the new Navigation to the end of the line. Hill writes, “In 1875 Alfred Watts bought the remaining holdings of the upper navigation system for $1.00 from the town of Brantford with the stipulation he keep in good repair the dams, locks and canal banks and afford access over the Grand River Navigation lands for sewer and drains” (p131). Of course that does not happen. In the mid-1880s Watts sells the entire canal system to the Brantford Electric and Power Company, which the power company’s President, Watts himself, forms with G. Wilkes, R. Henry and Watts’ two sons – C. Watts and A. Watts. Selling price is $40,000. By anybody’s reckoning a hearty increase from the original price of one dollar (p131). Jokes about Watts and electricity aside, the Navigation is kaput. The company abandons the last lock in 1880. You may ask. What about stateside? What about stars in skies of burgeoning Buffalo? Do exporters-importers from upper country in Canada go to Buffalo? Yes. They do. Newspaperwoman Jean Waldie writes, “January 13, 1854, was a gala day for Brantford, for it marked the long-awaited opening of the Buffalo and Brantford Railway. Notwithstanding inclement weather, 12,000 people are said to have assembled at the little depot to await the arrival of trains conveying invited guests from Buffalo and intermediate points. . . . Shortly after 2 p.m. the trains pulled in, to be greeted with loud cheers, firing of cannon and other demonstrations of rejoicing.” A regular Mayor Shinn, the mayor of Brantford, George Wilkes, makes a congratulatory speech (in Waldie p86; in Reville p184). Brantford to Buffalo is a railroad reality. The hometown band may have played Lida Rose. The Navigation is extinct but memory and lawsuits linger on. Right to our present day. After almost two centuries knots tie up the case. Hundreds of knots. A behemoth Anglo-American-Canadian spider has spun a sticky web of truths and secrets and lies. Villages built for the Navigation (except for the ghost town Indiana) do perform an economic turnaround because of railroads and stable infrastructures. By the mid-1840s the Six Nations Confederacy is really broke, not just pretend broke. The Councils at Onondaga are angry with government. And the people are furious with their chiefs and leaders. And with each other. The people wonder what happened to their wealth and their sovereignty. Who untangles the knots? In general we do know this. Economic depressions and shoddy bookkeeping and shuffled bank accounts, and shifty entrepreneurs plus the gross stupidity and negligence of Dunn, Colborne, the Family Compact and Reformers, all the aforementioned, follow an ancient recipe for making a major Indigenous catastrophe. One which leaves many Six Nation’s people dead from starvation and brings undocumented settlers into the Grand River Territory. One recalls Colborne’s seminal reason for building the canal. To help bring prosperity to an “impoverished” Six Nations settlement. What a joke. With bonds and monies and investments being held in trust, and enormous funds deposited into general revenue in England, why do the Six Nations not live well in 1832? On paper, the Haudenosaunee are rich but in life they have nothing. One can argue a great swindle of the Confederacy is well underway even before the Grand River Navigation Company comes into being. The Navigation finishes the job the colonial government and the British Crown have started. The Navigation wipes out the significant monies and holdings of the “impoverished” community, and kills the people’s dream of self-sufficiency and sovereignty. The Navigation and colonial government spend Six Nations’ monies freely and carelessly and foolishly and manage to keep the Haudenosaunee poor and desperate and internally divided. Many of the Haudenosaunee blame Joseph Brant for swindling them but Brant is not the villain in this story. Education is the answer to redeeming Brant’s reputation among the people themselves. Truthful education. Brant does not harm the people. The British government does. The colonial government does. Merritt and Thompson do. The Courts do. The Navigation fulfils the Crown’s long-time intuitive agenda of keeping Indigenous nations too poor to demand sovereignty. By 1845 a silent promise is kept. David Thompson’s Ruthven Park welcomes visitors but pamphlets and tours indicate nothing about the murky origins of the great hall or the Indigenous ownership of Cayuga Territory. One rarely reads anything about the real troubles of the Navigation and there’s nary a reference to the Navigation scandal at the big house. Some say there is a ghost named Bessie who sits on the hall’s nautilus staircase but no one speaks of a monster ghost who, like the blizzard in winter, blows a chill wind up and down the corridors. In the mausoleum of Indiana, a certain Ruthven Hall, David Thompson 1 owns most of the chill. To date the sole historian of the Navigation is Bruce E. Hill. Bruce Hill writes his master’s thesis in 1964 and thank goodness because Canadians can’t sweep history of the original Navigation’s crimes and Thompson’s shady dealings under the park’s welcome mat. One wonders whether Bruce Hill could research the same documents for The Grand River Navigation Company in today’s climate. The Navigation is more than a bad investment. From start to finish the Navigation is one great, awful, con job but Canadians don’t seem to care much about our history and the story gets kicked aside, time and again. “The town of Indiana was built to offer homes to mill and warehouse workers and a community to live in which was within walking distance to the canal. The community of Indiana was the brainchild of David Thompson, who, with thinly vested interest, promoted the Grand River Navigation Company using his government connections. His mansion, ‘Ruthven’ still stands on Highway 54 as a tourist attraction where it was built, it is said with Six Nations Trust Funds, in 1845 located at the edge of what was once Indiana, facing the Grand River. There is little trace of Indiana left except for the gatehouse at Ruthven Park. “This unauthorized use of Trust Funds has never been explained or dealt with by Canada or Brantford and remains on file today. In essence, the Township of Brantford had purchased stolen stocks from the GRNC and using those bogus stocks as authority to sell off the real estate, alienating the people of Six Nations from 360-acrea of their land and all future revenues, which could have been derived from this land had it not been stolen. “This claim has been registered several times in Six Nations petitions addressed to the Crown, but as of today, some 180 years later, there is still no settlement.